For the second part of the Stocks 101 workshop, Ian showed us how to make a white stock. White stock is basically made with chicken bones and veggies like carrots, celery, onions, leeks and herbs like peppercorns, bay leaf and parsley. Another thing that Ian brought up was you can add fillers like mushrooms, dumplings and grains like quinoa into a stocks to make a more filling soup. 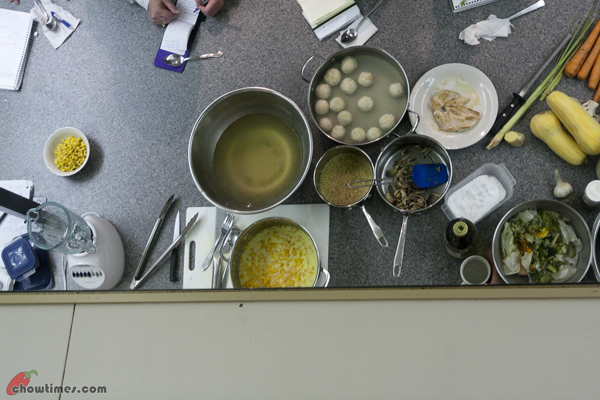 Ian planned to make a Chicken Broth with Matzo Balls from the white stocks. 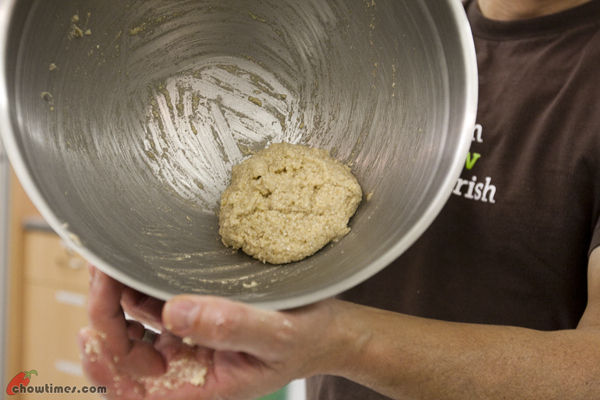 Matzo ball mix is a flour/wheat base with leavening. 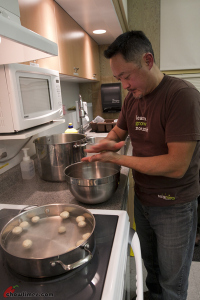 It is a great pantry item to whip up some quick dumplings. So, the first thing Ian prepared was the Matzo dough using the store bought Matzo ball mix. According to the instructions, you’ll need to add 2 eggs, 2 tablespoons olive or vegetable oil and salt to taste. You may add bits of ham, mushrooms, etc into the dough if you like to. It will form a wet dough and need to be chilled in the fridge to firm up while Ian proceed to demonstrate how to debone a chicken for the chicken stocks. 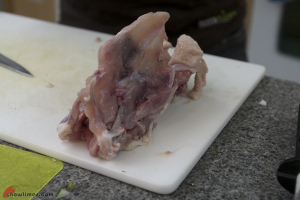 First, Ian bisected the chicken wings at the socket into wing tips, winglets and drumettes. Ian used a small pairing knife to do the whole deboning process, amazing!Tip: roasted wing tips are great for nibbling. Next, Ian separated the thigh from the breast by slicing through the skin between the thigh and the breast. There is no meat attach there. The next step is to bend the chicken leg the other way slowly to dislocate the joint. To remove the leg, Ian pulled back the leg, peeled and cut a little at a time towards the bone. What is left is the breast and the frame. The breast bone in the middle is very soft. Cut one or two milliliters from the breast bone down the center and you’ll see the tenderloin and the breast. Cut towards the bones to remove the breast and tenderloin.Tip: remove the tendon from the tenderloin which is chewy by holding the tendon and scraping it off the tenderloin. Finally,you’ll end up with the carcass for making stocks. You’ll need about 6 carcasses to make stocks. Stuff the neck and any other bones into the carcass when freezing it to save storage space. Ian also showed us how to stretch a chicken breast by butterflying it at the thicker part. One chicken breast can feed two people by thinning it out, pounding it and breading it.Tip: deep fried the chicken skins to make crackers. To make the chicken stocks, Ian used 6 carcasses with bones. Frozen bones are best for making stocks. You do not need to defrost the bones for making soup because as you defrost, you’ll loose some flavour through the liquids from defrosting. If you roast the bones before making stocks, you’ll end up with a brown stock. Roasted chicken bones will make the stocks sweeter. To make the chicken stocks, Ian added 4 carrots, 2 sticks of celery, 1 large onion, some thymes and 1/2 teaspoons whole peppercorn. The vegetables are chopped relatively small so that more surfaces are exposed and give more flavour. The ratio of vegetables to chicken bones is about 20%. Add enough cold water to cover all the ingredients and bring the water to a boil. Once it’s starts to bubble, reduce it to low heat to simmer, uncover. Do not bring the stocks to a rolling boil as it will yield a greasy stock. The rolling boil process will emulsify the fat. Skim off the scums that forms on the top with a spoon. The chicken stocks has to be simmered for 45 minutes to an hour. 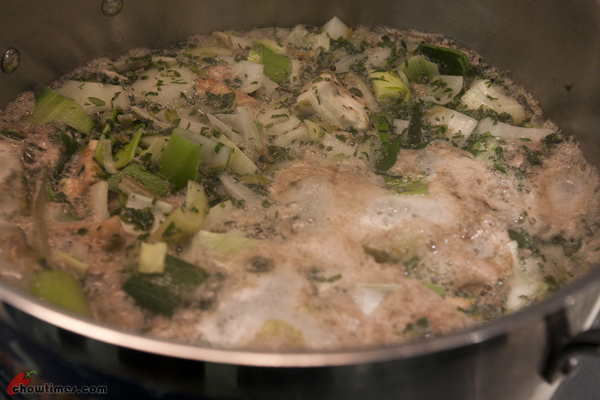 Do not over cook the stocks as the vegetables will disintegrate and makes a the soup cloudy or muddy. Strain the stocks and chill in the refrigerator after it cools off. You may then remove the fat cap easily the next day. 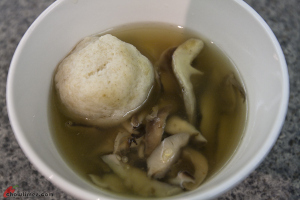 Roll the chilled Matzo ball into toonie size ball and drop into salted boiling water for 30 minutes, cook covered. 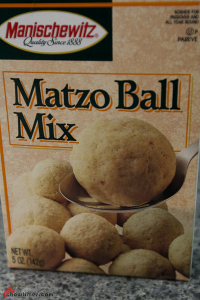 The Matzo balls will double in size into a golf ball size. For small balls, it will take lesser time to cook. Matzo ball will not overcook. You can store cooked Matzo ball in the fridge for a couple of days.You can serve Matzo balls as dessert when served in coconut milk and sugar. Ian used two types of mushrooms, shiitake and oyster mushroom. Remove the stem from the shiitake mushroom as it is rubbery. You can use the stem for making stocks. Thinly slice the stiitake mushroom. Shiitake mushroom is silky smooth. For this recipe, one mushroom can serves two people.Remove the stems from the oyster mushrooms. They are good for stocks too. You can simply tear the oyster mushroom into smaller pieces. 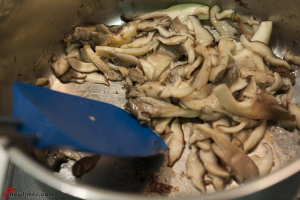 Oyster mushrooms are spongy.Saute the mushrooms with some olive oil and season with salt. Cook until all the liquid evaporates and the mushrooms give a squeaking shoes sound when moving with a spatula. Season the butterflied chicken breast with salt. Pan fry in a hot pan with a little olive oil. Do not move the chicken until it’s lightly brown on one side. Then brown the other side.You may brine the chicken in a 10% salt brine for a nice and juicy chicken.When cooking chicken breast, cook just until pink and let it rest. The residue heat will continue to cook the chicken. 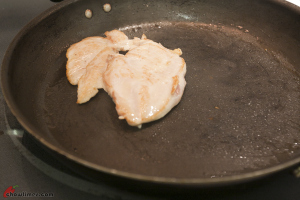 You’ll end up with a tender chicken breast instead of a dry and tough chicken breast. 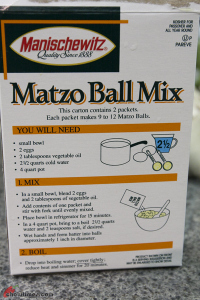 To assemble the Chicken Broth with Matzo Ball soup, place the ingredients i.e. 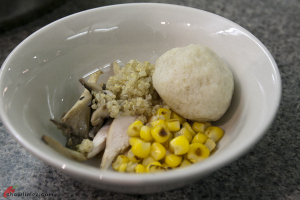 a Matzo ball, a few slices of mushrooms, a few slices of chicken breast, some caramelized corn, some quinoa in a bowl. Assembling the individual ingredients just before serving will retain the distinctive flavours from the individual ingredients instead of placing all the ingredients into a big pot of broth. Ladle the chicken stocks into the bowl. Here you are, a flavourful Chicken Broth with Matzo Ball Soup. 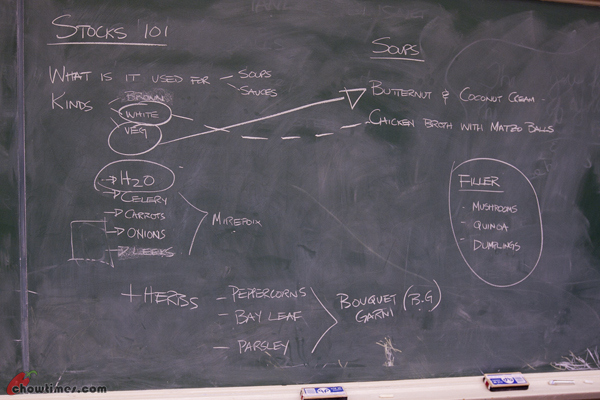 The chicken broth tasted really good.Ian, thank you again for a great workshop. This certainly comes handy in this coming cold winter. Back when my family still made an effort to be religious and have Shabbat every Friday night, I usually got put on Matzah Ball duty. This is one of my favorite foods. I’ve found that that usually end up tasting better when you boil them directly in the soup instead of in an external pot — that way, they soak up some of that great chicken-soup flavor. This is one of my favorite comfort soups….reminds me of all the amazing Jewish delis in the US. This has a unique twist with the mushrooms, chicken breast, caramelized corn and quinoa. I would love to try making this but I looks like quite the production! !